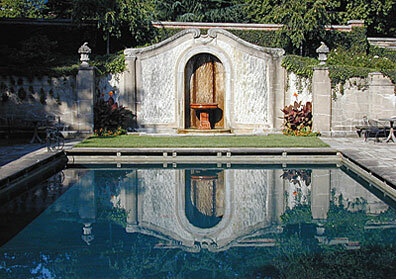 Out of Dumbarton Oaks’s many prominent garden features, the swimming pool remains one of the most popular. The pool was built in the early 1920s, replacing the stable yard and manure pit belonging to the previous residents. Currently, the pool is available for use by all staff and Fellows of Dumbarton Oaks outside of the garden’s public hours. Not surprising given the hot Washington, DC summers, the pool has become a coveted attraction for staff and visiting Fellows. While the pool looks relatively peaceful now, it has had a storied history full of hijinks and even one death. 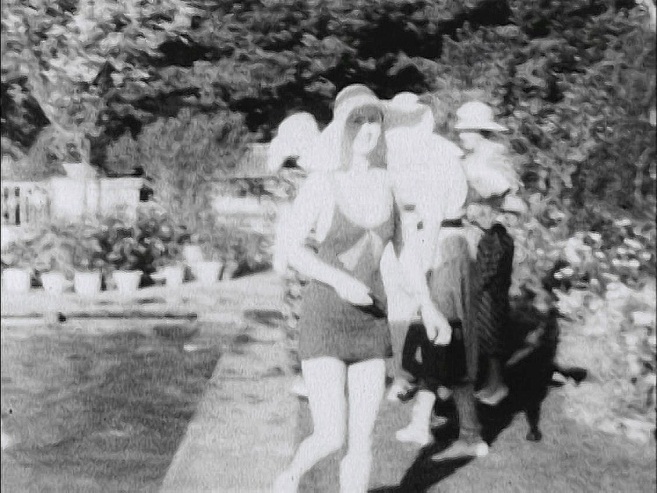 Many interviewees reference the time they spent by the pool, and some even recall local residents’ illicit trips into the garden to use the pool themselves. Swimming Pool Party, ca. 1933. Mildred Barnes Bliss, center. And then of course, we found the swimming pool. Now, the swimming pool was an issue because John Thacher – who was then Director of the Byzantine Collection – was not pleased to have that swimming pool, not really at all. It was the bane of his existence, and he would happily have had it paved over. And there were several attempts to get rid of it, but it never worked. So we were all thrilled…. And so often we worked in the afternoon or maybe sometimes in the early evening and then we would swim. Or maybe on a day off we would just come and swim. It was pretty dreamy. It was very nice. Now there were other swimmers as well, but they were not legal swimmers. People would scale the walls and come over and jump in the pool. So you could understand that Thacher wasn’t too happy about the idea of invaders. [We didn’t have much contact with him] because all that we could see was the possibility of a cement mixer pulling up in front of the pool. [laughs]. James Carder, curator of the House Collection and Archivist remembers being a Junior Fellow and hearing stories from all of the older scholars about the times they would sneak into the garden after hours for a midnight swim. For Washington residents above a certain age, he says, an illegal swim in the pool was a childhood right of passage. And the only thing I really remember is somebody unacceptable went swimming in the swimming pool and so there were large notes that you – it didn’t matter if you were on the board of trustees of Harvard – you were not allowed to swim in the swimming pool. I remember looking at that and thinking, that’s just really weird. But I don’t even know who it was that insisted that they should be allowed to swim in the D.O. pool. The most bizarre account in the history of the Dumbarton Oaks swimming pool may be the death of Byzantinist Alexander Kazhdan. The story has taken on a small life of its own, but Richard Diehl has one account of the incident. After leaving the Soviet Union, Kazhdan eventually came to reside at Dumbarton Oaks and was one of the pool’s most enthusiastic swimmers. While the gardeners would have wanted to close it in September, Kazhdan continued his daily swims, long past the time when others would have considered the water far too cold. It was in the pool on May 29, 1997 that he eventually died, being found there by the staff. Despite all the stories about the pool, it serves one main purpose: to draw together the Fellows and staff in such a way that promotes scholasticism and socialization. 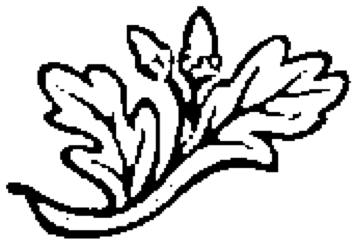 If the reminiscences of former Fellows is any indication of this, it has most definitely achieved the purpose for which it was envisioned.